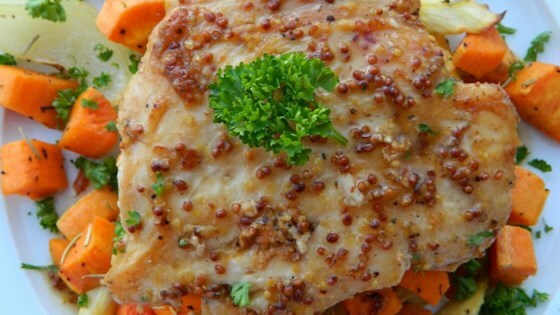 "Paleo or not, this combination of flavors will tickle your taste buds! Colorful veggies and chicken work for a weeknight or for guests." Place an 11x17-inch baking sheet in the oven and preheat to 425 degrees F (220 degrees C). Combine butternut squash, carrots, parsnip, sweet potato, and red onion in a large bowl; add 2 tablespoons olive oil, rosemary, 1/2 teaspoon sea salt, and 1/4 teaspoon pepper and stir to coat. Spread vegetable mixture in a single layer onto the warmed baking sheet from the oven. Roast vegetables in the preheated oven for 15 minutes; stir and continue roasting until tender, about 15 minutes more. Pound chicken to 1/2-inch thickness on a work surface; season with 1/4 teaspoon salt and ground black pepper to taste. Heat 1 tablespoon olive oil in a large skillet over medium heat; cook chicken until no longer pink in the center, about 5 minutes per side. Transfer chicken to a bowl. Pour chicken broth and wine into the same skillet and bring to a boil while scraping the browned bits of food off of the bottom of the pan with a wooden spoon, about 2 minutes. Stir honey and mustard into wine mixture; add chicken and turn pieces until coated. Serve chicken alongside roasted vegetables. A crunchy chop salad gives roasted chicken contrasts of taste, color, & texture. Though this is not a one-pan dinner, it is very easy to cook the chicken on top of the stove while the veggies roast away in the oven! Actually, any combination of root vegetables would work - use what you have. A simple green salad and bread, if you like, complete this meal. I didn't love this, but that might be because I'm not a big mustard fan. I also thought the veggies were a little bland. I let the chicken simmer is the sauce for a few to let the sauce reduce and thicken. It was delicious. Very tasty, exactly as written, except I used extra marjoram and garlic powder on the vegs. The mustard sauce adds a nice flavor. It was runny, so I added corn starch. The honey mustard chicken is nice although I think the vegetables can do with more seasoning. I added quite a few herbs to the squash and carrots...namely basil, thyme, oregano. Turned out great! Deeeeelishus! The only different thing I did was throw a little brown sugar on the veggies halfway through. Served it w/rice. Even my picky husband had seconds. It's a keeper!